You may think that wireless headphones are not your thing – you might fear that the battery would drain too quickly (and right as you listen to your favorite song…), or that the sound would have that vintage walkie-talkie effect. I get it. I used to think this way myself, but I’d like to invite you to reconsider these notions. Are you in? Great! Picture this: you're standing on an overcrowded bus or train, on your way to work. You feel sleepy, tired, perhaps already wishing for the day to be over... Until you put your headphones on, start a music playlist and are struck by a sharp change of mood. It may even feel like the world is moving to the sound of your favorite tunes. We've all been there. Music has a powerful effect, and you wouldn't want this sensation to be disrupted by the sudden death of a worn-out cord, or by your tangled headphones being abruptly detached from your smartphone. You don't need to go through this – after all, it's 2018, and we've listed the 5 best wireless headphones on the market, with serious audio quality and long-lasting battery life. They'll keep the world moving to your chosen soundtrack, and you'll be free from cord drama. Although this article will focus on on-ear and over-the-ear wireless headphones (still our users' favorites), we are all for progress and don't only support classics, so stay tuned for our upcoming list of top wireless earbuds. Picking headphones can be an excruciating task for some, considering the high product availability and the fact that key elements of this decision can seem impalpable – but we'll explain why they are, indeed, relevant. 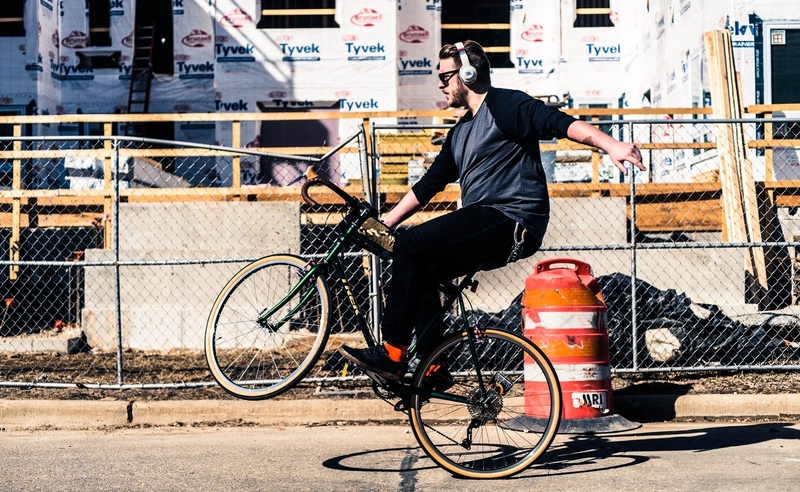 We've handpicked top Bluetooth headphones by taking into account battery life, maximum Bluetooth range, lowest and highest frequencies, as well as impedance, noise-canceling function and other features that make these products stand out. Additionally, we've made sure to include in-ear, on-ear and over-the-ear options, so no matter your preference, you'll get what you're looking for. While battery life is a no-brainer (the more, the merrier, and the fewer times you'll need to charge your headphones), properties like impedance can be puzzling, but they're really nothing to fear. Impedance stands for a device's resistance to the electric current passing through it. The reason why this matters for wireless headphones is that the lower the impedance, the less battery power is required to listen to music and podcasts at high audio levels with on-the-go devices, which are compatible with this level of impedance. This is not to say that high-impedance headphones are of no value – they're actually better suited for wired use with high-impedance-demanding equipment. The maximum Bluetooth range is another important factor for your cordless audio life, as it determines how far your headphones can reach for a device to connect to. As for the lowest and highest frequencies, which we also recommend keeping in mind: the first indicates the device's ability to reproduce low-frequency audio, whereas the latter specifies its capacity to play high-pitched tones. The broader the range between the lowest and highest frequencies, the more bass and treble sounds can be delivered by your headphones. Finally, headphones equipped with noise cancellation (also known as active noise control and active noise reduction) help filter background noise, allowing you to focus your hearing on what you want without distractions. 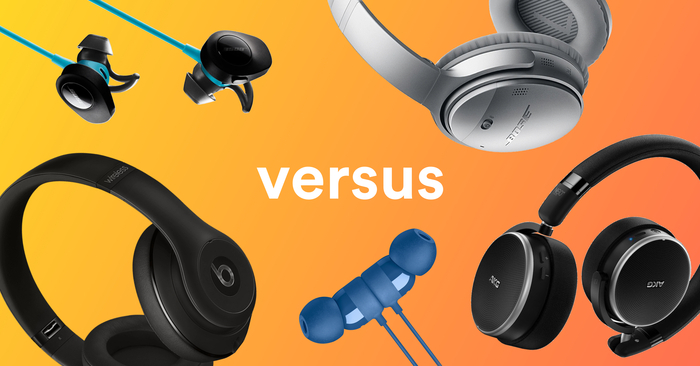 Now let's move on to the 5 best on-ear and over-the-ear wireless headphones selected by Versus. After the successful launch of Sony's WH-1000XM2 headphones in 2017, the company made sure not to lose the leading rank when it comes to over-the-ear noise-canceling headphones. One year later, Sony introduced the WH-1000XM3 over-the-ear headphones, with technical upgrades and improved usability. The Sony WH-1000XM3's noise-canceling technology surely beats its predecessor's, thanks to a dedicated HD noise-canceling processor. The WH-1000XM3 has the same battery life as the WH-1000XM2 (30 hours of continuous playback with noise cancellation, or 38 hours without the feature), but it is slightly lighter. Driver unit and frequency response also remain the same, the detachable cord is now a little shorter (a drawback for some), and impedance increased from 46 to 47 Ohms; however, the Bluetooth version improved from 4.1 from 4.2, and sensitivity increased from 98 dB/mW to 101 dB/mW (cable-free mode). Atmospheric Pressure Optimizing technology for fine-tuned sound during flights, touch volume control, as well as the Quick Attention feature (which allows the user to decrease sound levels by placing one hand over the right ear cup) were maintained, but the battery has been significantly improved. The WH-1000XM3 reduces charge time from 4 to 3 hours, and the fast charging feature, which previously secured 70 minutes of music after 10 minutes of charge, now assures 5 whole hours of playback after the same charge time (a 1.5A AC adapter must be bought separately). 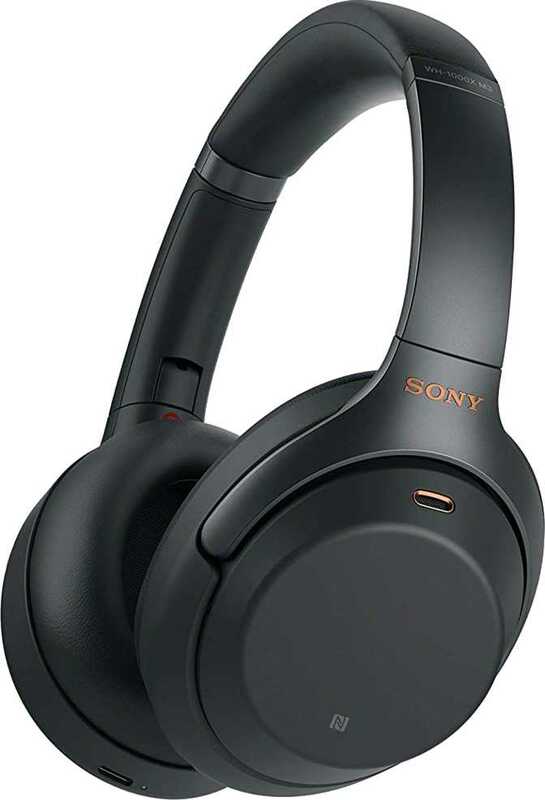 The Sony WH-1000XM3 is also compatible with voice assistants (enabled in the previous version after a software update) and keeps the praised Adaptive Sound Control feature, which detects activities and automatically adjusts the sound to different situations. Nevertheless, the user still has complete control and can switch between various ambient modes via an app. Furthermore, Sony's latest high-end noise-canceling headphones promise a "virtual surround sound" experience (optimal for concerts and other environments), and like the previous model, tailor noise cancelation to the user's body, taking into account head size, hairstyle and use of glasses to optimize sound performance. Known as the be-all and end-all of active noise cancelation, Bose had already made a statement in 2017 with the QuietComfort 35 over-the-ear wireless Bluetooth headphones. An updated model, Bose QuietComfort 35 II, was released in 2018, with a single add-on: a dedicated Google Assistant button on the left earcup. Other smart assistants did not get such exclusive treatment, but may still be reached with the right earcup's multifunction control. Other than that, you will find the same features (and issues, such as a battery that many buyers have struggled with). Besides an extra-comfortable design, this product's highlight is unquestionably the brand's Acoustic Noise Canceling feature. 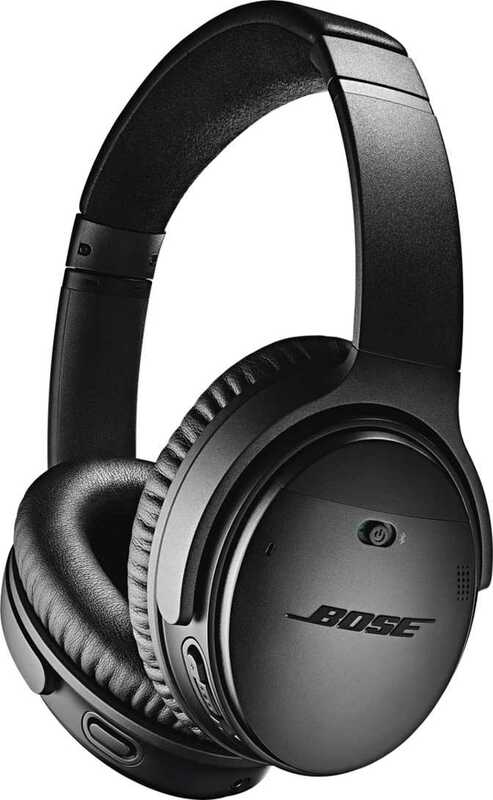 This technology, which can be managed via the Bose Connect app, sends out opposing signals that counteract outside noise and has been endorsed by both Bose enthusiasts and users new to the brand. Back in 1992, when Dr. Dre's groundbreaking solo album "The Chronic" was released, it would be hard to imagine that the hip-hop icon would be one day more associated with an audio brand, Beats by Dr. Dre. Although I'll still think of Dr. Dre's music (be it solo, with the World Class Wreckin' Cru or with the N.W.A.) 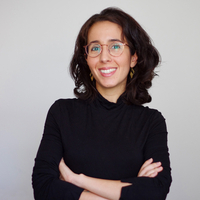 a dozen times before headphones spring to mind, web search volumes prove that a younger generation is more concerned with the premium headphones brand created by Dre and by legendary producer Jimmy Iovine, and later acquired by Apple. Released in late 2017, the Beats Studio3 Wireless over-the-ear headphones remains the brand's best, and one of the top options for over-the-ear/on-ear wireless headphones. 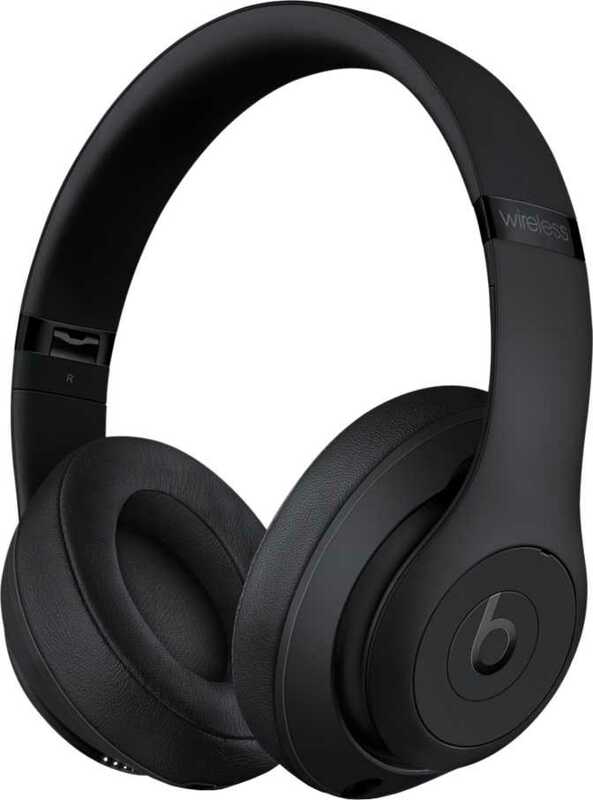 Available in several colors, including a luxury line and special RETNA/DJ Khaled and Mickey Mouse editions (the latter, perhaps the hardest for the old school Dre fan to come to terms with), the Beats Studio3 Wireless have basically the same design as the predecessor model, only with more comfortable earpads. What makes a huge difference, though, is not in plain view. The Beats Studio3 Wireless headphones offer distinctly improved, more balanced sound, as well as almost twice their precursor's battery life: 22 hours using all features or up to 40 hours without Pure ANC, the brand's proprietary responsive noise-blocking technology. Pure ANC pledges to "continuously pinpoint and block external sounds while automatically responding to individual fit and music playback," calibrating the user's audio up to 50,000 per second (! ), thanks to Apple's W1 chipset. Other appealing traits are the Fast Fuel feature, which assures three hours of playback after 10 minutes of charging; class 1 Bluetooth technology, which vows for more freedom of movement with "fewer dropouts than ever"; and the ability to seamlessly switch between iCloud-registered devices (macOS Sierra, iOS 10, watchOS 3 or later versions). Unfortunately, the Beats Studio3 Wireless cannot be folded flat and are rather bulky to carry, which might be the model's biggest downside. For the price, you may be able to score one of our top two contenders, but the hype is real and so should be individual freedom – so even if you just want to be seen walking around with a pair of Beats over your ears, more power to you, go for it! Microsoft... Headphones? And in our top 5 over-the-ear and on-ear wireless headphones list? Most definitely. The company is said to have worked on its first pair of wireless Bluetooth headphones for three years, and the Surface Headphones, hitting stores this holiday season, are no flop – quite the opposite. 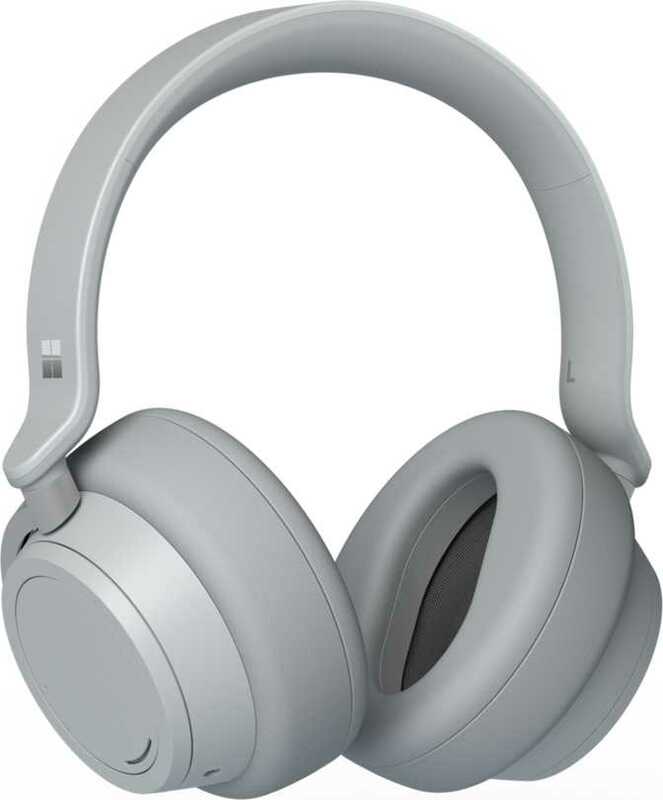 As expected by consumers, the Microsoft Surface Headphones feature noise cancellation and are compatible with Microsoft, iOS and Android devices. 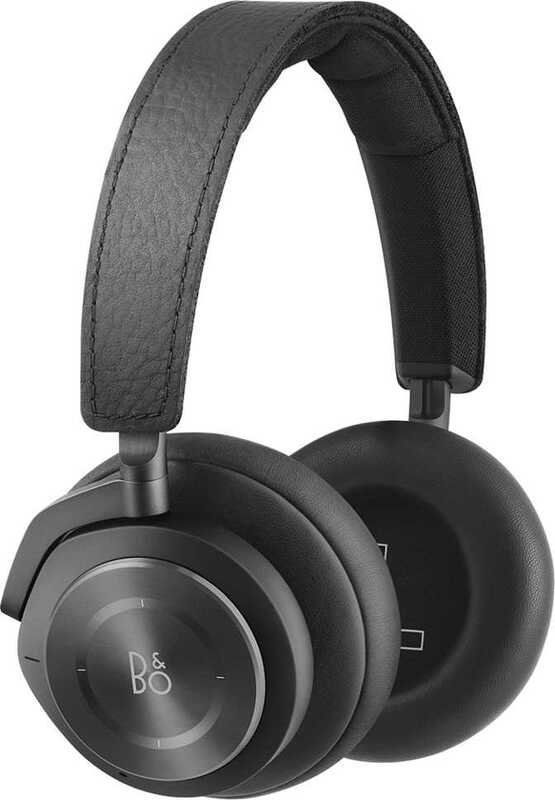 Although the one-color availability may seem off-putting to those in search of a trendier look, the level of comfort provided by these headphones' memory foam padding would be reason enough not to snub this product, although it is not the main reason to give the Surface Headphones a go. Besides featuring touch controls to play, pause and skip tracks, answer and reject calls, as well as to invoke the Cortana smart assistant, Microsoft integrated dials into each earcup. The right wheel is dedicated to volume control, and the left one allows the user to quickly go through 13 levels of noise cancelation. Although sound quality will not disappoint most purchasers, and equalization settings can be accessed via an app, this is not the product of choice for audiophiles; however, as such users will unlikely feel well-served by any of the wireless headphones currently on the market, this is to be expected. The Microsoft Surface Headphones' battery life, however, is rather disappointing: only 15 hours of full-featured playback (Bluetooth and active noise cancellation). As expected of recent products in this price range, there is a quick charge feature, and given that the always-on Cortana is likely to blame for the short battery life, we do hope that an update enhances playback time in the near future. If you, like me, cringe at the thought of wearing "soft lambskin" and "genuine cowhide leather," you might want to consider another model. If, however, you are not put off by animal products and indulging in lavishness is your day-to-day goal, you may have found the be-all and end-all of wireless audio. Available in black and "natural" tones (whatever "natural" is meant to signify here), as well as in a limited limestone shade from the brand's Autumn Winter 2018 Collection, Bang & Olufsen's Beoplay H9i is the most expensive-looking (and expensively-priced) option in our list. Finely tuned by Bang & Olufsen's sound engineers, these high-end wireless headphones feature active noise cancellation for complete immersion in music, as well as a mode that allows you to also hear your surroundings (Transparency Mode). Moreover, an aluminum touch interface allows for playback control with simple earcup gestures – which, the brand states, works even if the user is wearing gloves. The Beoplay H9i's exchangeable battery warrants up to 18 hours of full-featured playback (up to 23 hours without ANC), which can be extended with the use of an additional battery (sold separately).